DONETSK, Ukraine -- Voters streamed into polling stations Sunday to vote in snap referendums held by Pro-Russian activists in eastern Ukraine eager to declare independence from Kiev. "Do you support the Act of Independence of People's Republic of Donetsk?" The options are "yes" or "no." A similar question is being put to voters in Luhansk. Many of the voters were not on the registration lists, which were outdated, but were allowed to vote after showing identification documents. A CNN crew saw several people vote twice at one polling station, where the ballot boxes were decorated with new Donetsk independence flags. There also seemed to be no system in place to prevent one person from voting at multiple polling stations. The polls will stay open for 14 hours, rather than the usual 12, to allow time to add people to the voter list if necessary, the election committee has said, adding that access to the most recent electoral rolls has been barred by Kiev. Two incidents heightened tensions at polling places, a Donetsk election committee spokesman said. Rubber bullets were fired into the air at one in Donetsk, said Sergey Tretyakov. 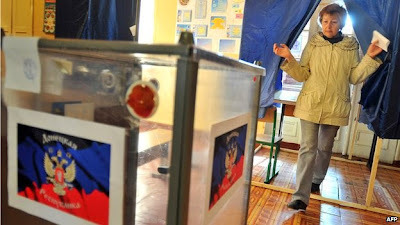 In Krasnoarmeysk, police tried to prevent people from voting. The central government in Kiev has declared the polls illegal. The message coming from Moscow on the referendum appears mixed. Russian police officers oversaw voting at a Moscow polling station erected for expat Ukrainians to vote in the Donetsk and Luhansk referendums. But last week, Russian President Vladimir Putin also urged the pro-Russian sympathizers to delay the referendum to give dialogue "the conditions it needs to have a chance." Putin's unexpected call appears to have dented the confidence of some pro-Russian activists. However, representatives of the pro-Russian groups in Donetsk and Luhansk voted to go ahead with it. Meanwhile, in Slavyansk, a Russian government-controlled TV channel was periodically showing a banner along the bottom of the screen that told viewers where they can vote in Sunday's referendum. That channel, Russia 24, is available over the air to residents of Donetsk, who can access it in their homes. The banner listed the location and voting hours and advised voters to bring a passport. The banner was only shown on the Russia 24 channel and not on other channels. A vote for autonomy is a vote for the self-destruction of the east, Ukraine's acting President Oleksandr Turchynov has said. It would cut residents off from the national economy and social programs, he said. "It is a step nowhere for these regions. It is euphoria that may lead to very complex consequences, and many people can already feel them." They have felt the pain in bloodshed, at graves and in burned out ruins still smoldering in the east, where ethnic Russian militiamen have battled Ukrainian security forces. At least seven people were killed and 39 others were injured on Friday in the southeastern city of Mariupol, regional sources said. The electoral commission office in Donetsk was ringed with sandbags and barbed wire on Saturday. Men in balaclavas lounged outside tents pitched nearby, looking relaxed. They wore the orange-and-black St. George ribbon, which has become a symbol of the pro-Russian separatists. A dozen men lined up in front of the regional administration building to sign up for "military service" with the pro-Russian Donetsk People's Republic. They showed their ID documents and registered at a small tent. Deadly clashes have also stained Mariupol and Odessa with blood, as well as Slavyansk, where separatists hold key government buildings and remain in a standoff with Ukrainian military forces. Militants have erected concrete barricades on the roads into town there. Results of the polling are expected to emerge late Sunday, not long after the polls close. If they come out strongly in favor of secession, they would also stand in contrast to recent polling by the Pew Research Center, which show that 70% of people in eastern Ukraine want the country to remain united. Whatever the outcome, the vote has already been condemned as illegitimate by several Western powers. Speaking Saturday, German Chancellor Angela Merkel said, "We consider the referendum scheduled for tomorrow illegitimate and focus on the (presidential) election on May 25 in the entire Ukraine." The interim government in Kiev, which took power after ousted pro-Moscow President Viktor Yanukovych fled to Russia in February, is due to hold presidential elections May 25. Merkel and French President Francois Hollande have warned that Russia could face consequences if the presidential vote does not go ahead as planned. "If no internationally recognized presidential election were to take place, this would inevitably further destabilize the country," Merkel said. In that case, she said, "we are ready to take further sanctions against Russia." Merkel and Hollande also said that Russian troops along the Ukrainian border "should undertake visible steps to reduce their readiness." Putin announced a troop pullback Wednesday but NATO says it has seen no signs of a withdrawal of Russian forces from the border area. Russia annexed the southern region of Crimea after announced results in a separatist referendum showed more than 90% in favor of joining Russia. In an independent Pew survey, 54% of Crimea residents polled showed support for secession. The Kremlin has said that it has no interest in annexing other parts of Ukraine. But it is pushing for the country to adopt a constitution that would give regions where Russian is widely spoken a larger voice in policy making. Critics fear that the creation of autonomous pro-Russian regions in Ukraine would cement alliances with the Kremlin that would give it essential control over them.